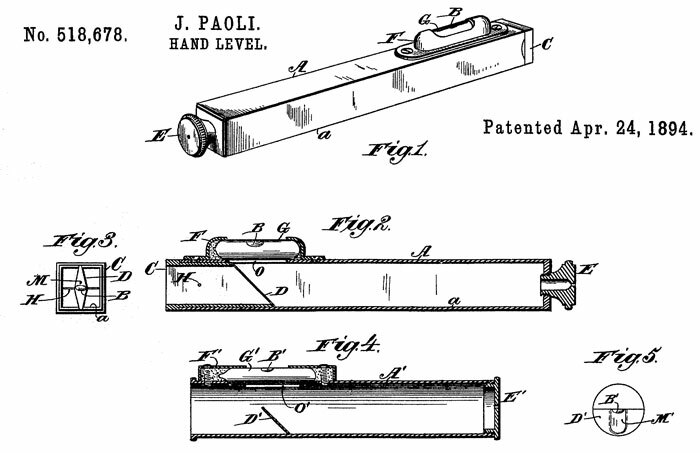 John Locke, in U.S. patent 7477 (7477 at Google Patents) dated July 2, 1850 , describes the basic design for the hand level. The target is sighted directly with no optics. A lens in the form a 1/2 circle is used to focus the bubble. After this patent expired many "Locke" hand levels were made. 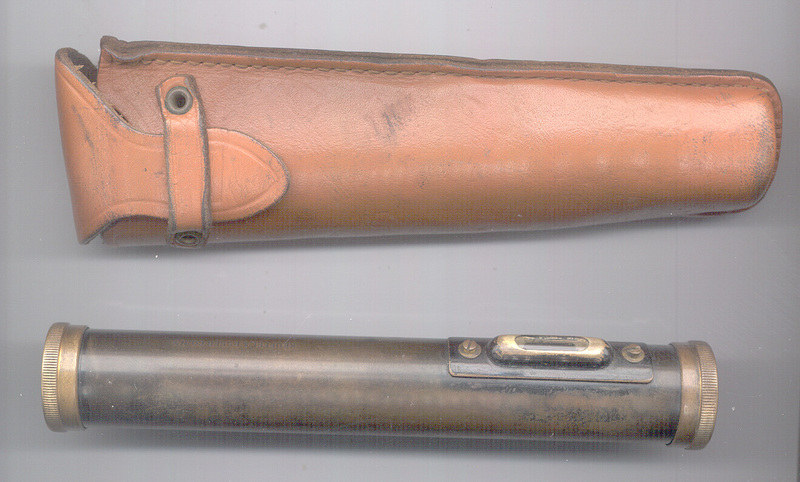 I think this is a very early hand level made by K & E. The main tube has a square cross section of about 0.57" x 0.57". In the photo above the right hand 1/2" square portion is designed to slide in and out of the main square tube and by so doing the line of level can be adjusted. Stamped on the top surface is "KEUFFEL & ESSER CO. N.Y. Since K&E started in business around 1876 this design probably was made to get around the Locke patent. This is an image aligned at 45 degrees of the center reflector. The right hand portion with the 45 degree bevel toward the eye end (at the very left) has a silvered surface at the center that acts as a mirror to allow viewing the bubble from below at the center line. Looking back into the front right hand part there is a horizontal metal vane that acts as a cross line to mark the target. There are no optics, other than the first surface mirror. The eye hole has threads (Why?) with an I.D. of 0.168". The purpose of the 0.168 thread may be to allow the installation of a peep hole eyepiece. 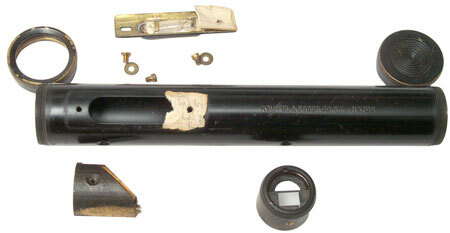 This peephole is on a K&E hand level marked with the patent date of 24 Apr 1894. 518678 Hand Level, J. Paloi, Apr 24, 1894, 356/249 - probably sold to K&E. If you know anything about this level email brooke(at)pacific(dot)net. As far as I can tell there are no lenses in this instrument. If I wear my reading glasses I can see the bubble, although out of focus, and can accurately center it vertically on the horizontal reference line formed by the sheet metal vane at the front of the instrument, but the far objects are blurry. If I don't wear my reading glasses there is a bright spot where the bubble is located, but the horizontal cross line is about invisible. Moving the front piece back and forth will allow the largest bubble image to be centered on the horizontal line and does not change the level line. After the Locke patent expired K&E started making their version. That's why there is no patent info on it. This level is not marked N5702, but I think that is the pattern. Just marked Keuffel & Esser C0. N.Y. Note that the front "glass" is not a lens, just a glass to keep the inside clean. Also there is a rear "glass". There is a 1/2 circle lens about 2 1/2 inches from the eye hole that allows your eye to focus on the bubble when it is also focused at infinity to see the target. It's not clear how the sight line is calibrated to be level. This is very similar to the hand level used by my Uncle, Charles Carrithers, to check lath stakes when leveling land. In addition to the level he had a lath on the tractor with a notch, maybe 3 feet up from one end. The laths driven into the ground by the surveyor had a horizontal mark 3 feet above the desired grade. So if he saw the mark from the ground where he was sighting then the grade was correct. If not he would know how much to cut or fill. 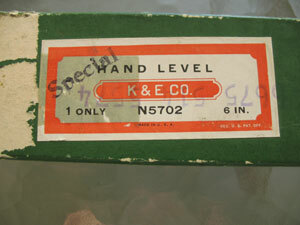 There are other Locke pattern hand levels made by K&E that have the model number N5702 or N5703, I'm not sure of what differences there are between these. 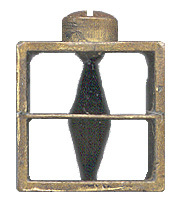 At the lower left is a half cylinder with a first surface mirror held on by a screw. This assembly is held in the tube by a single flat head screw (the hole in the tube is just above it). At the lower right is the half lens. The upper part has no glass. The square part below has a lens to allow an eye focused at infinity to also focus on the bubble. Someone has use a few pieces of 3x5 card to shim the rear end of the level vial. The level vial has a single fiducial mark at the center, not the two marks as are common on builder's levels. 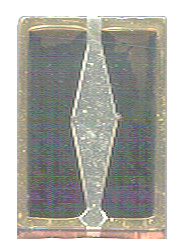 This way the view through the tube is the bubble vial on the left with the central mark acting as cross hairs. Photo supplied by Bill G. asking what's special about it. Notice that the box has been stamped with the NSN 6675-514-5574. It may be that the Special nature is just the assignment of the NSN. If you know about it let me know. Note that an Abney hand level is also called a clinometer. It is different than the Locke hand level in that it has a vertical scale to measure the inclination of the instrument. If you know the patent number (UK or US or ?) please let me know. The design of the Abney has the back of the scale covered by the frame that holds it. There was a requirement to have two different scales. If they were both on the same part (side by side) the operator often read the wrong scale, so two scales were supplied and the inclinometer needed to be disassembled and reassembled to change scales. 1125053 Surveying Instrument, H. Brautigam, Jan 19 1915, - describes the Abney then adds a hole in the side of the tube to make a 90 degree sight. 2285285 Clinometer, W.L.E. Keuffel (K&E), Jun 2 1942, - has a movable index that blocks the unused scale from view. 5 1/8" long x 1" square "Locator's Level"
The square tube versions allow resting the level on a bench or other support without it rolling. Also some of the square tube versions have the 90 sighting feature. 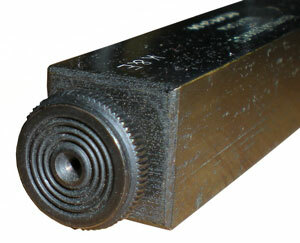 "Weber Phila No 6160" is a 5" long when collapsed and 5 1/2" long extended hand level with a 13/16" diameter round tube. This is the time this page has been accessed since since 4 Feb 2003.